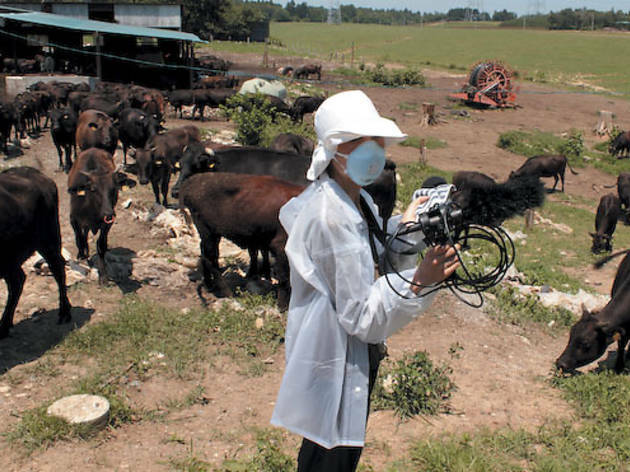 OUT TO PASTURE Kajino milks some good cow footage in the nuclear evacuation zone. The filmmakers will screen a preview of their in-progress documentary, Uncanny Terrain, at a Sunday 5 fund-raising event. Donations will finance a second, two-month-long trip to Fukushima in March to document the one-year anniversary of the meltdown. They expect to release the film in 2013. “A lot of people tried to talk us out of going to Fukushima,” recalls Koziarski, 36, who set aside freelance writing gigs for the Reader and TOC to make the film. Early on in the filming, Kajino and Koziarski took preventative measures, donning surgical masks, drinking only bottled water and avoiding meat, milk and mushrooms—foods infamous for high cesium levels. They also carried a Geiger counter to test background radiation levels. But it wasn’t long before they let their guards down. High Concept Laboratories (1401 W Wabansia St) presents Fukushima: 1 Year After the Meltdown, a benefit for Uncanny Terrain, Sunday 5, 5–8pm. Donations accepted. RSVP (required) at uncannyterrain@gmail.com.